Shut up Lykos! 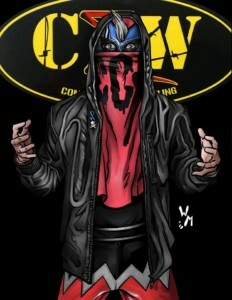 The CCK are in the CZW Game! The latest duo that will be part of the Combat Zone Wrestling set are the current CZW tag team champions, Chris Brookes and Kid Lykos! The Calamari Catch Kings, or CCK for short, are the hottest tag team on the British independent circuit. Their tandem offense is mind blowing and they have wrestled and beaten many of the top tag teams on the European continent. In fact, the duo won the CZW tag team titles in Birmingham England from Scarlet and Graves on a non-CZW show. They have gone on to defend the CZW tag team titles multiple times in multiple promotions throughout England. Now that The Rep have won the top contendership to the titles, they are insisting that the CCK make their CZW debut and defend the titles in America. Whenever this encounter happens it is bound to be exciting! 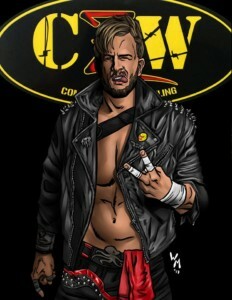 The CCK joins Sami Callihan, MJF, Ace Romero and the Rep in the 5th CZW expansion. The game begins mailing on November 14th and will be available at CZW Night of Infamy on November 11th. 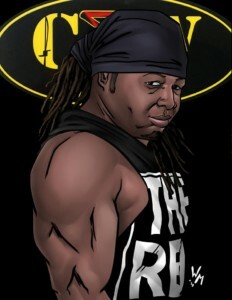 You can pre order CZW Set 5 right now by going HERE and the Shimmer Volume 5 game by going HERE. 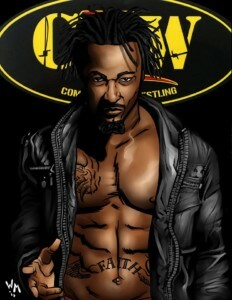 The latest addition to the CZW game is one of the Combat Zone’s newest competitors and certainly one of its largest. But don’t let Ace Romero’s size fool you, he is insanely agile for his size and is out to prove himself to the CZW faithful. Acey Baby comes from Maine and wrestled all over the New England scene before making his CZW debut in July. He surprised many by winning the 10-man Aerial Assault match in August, which earned him a CZW Wired title shot in September. Unfortunately that title opportunity was spoiled by Greg Excellent, who took exception to Romero joining CZW as another big man. Their first Hoss Battle ended in a no contest, but this rivalry is just getting started! 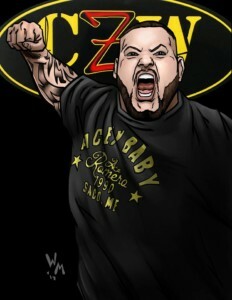 Ace Romero joins Sami Callihan, MJF and The Rep in the newest CZW expansion. Keep an eye out the rest of October for more names in the CZW 5th edition game pack. The game will be released in early November and will be available at the Night of Infamy show on November 11th. Preorder begins next week! 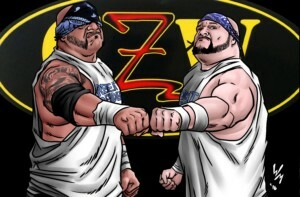 At the first CZW Dojo Wars show Nate Carter and Dave McCall came together to form the tag team the Dub Boys. Their success in Dojo Wars earned them a spot on the main CZW roster. However, after building some experience against some of the top teams in CZW, the duo felt they did not get the respect they deserved and now feel they need to go out and get what is owed to them. Carter and McCall dropped the Dub Boy moniker and now go by The Rep, since that is the only thing that matters in making your way to the top. The duo got irate the CZW Tag team Championships remain in the UK, and voiced their displeasure to the CZW crowd before being confronted by CZW Vice President Maven Bentley, who made a special match. In September The Rep won the Chri$ Ca$h Memorial Ladder Match at Down With The Sickness to earn the top contendership to the CZW tag team titles. Now their await their title opportunity and look to prove what they have felt all along, that they are the top tag team in CZW! 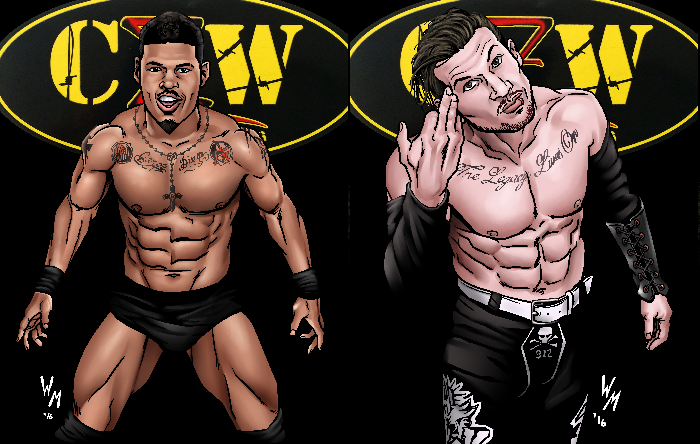 The Rep joins Sami Callihan and MJF in the newest CZW expansion. Keep an eye out the rest of October for more names in the CZW 5th Edition game pack. The game will be released in early November and will be available at the Night of Infamy show on November 11th. For a couple years CZW was without one of its most dynamic performers, but at Cage of Death 2015 the Callihan Death Machine made his triumphant return! Sami Callihan had a period away from the independent wrestling circuit, but since his return has been taking it by storm and traveling far and wide on his quest to be known as the Best Wrestler in the World. The Ohio Native has made waves throughout the indies, but of course nowhere is his influence felt stronger than in CZW. He has once again hooked up with Jake and Dave Crist as part of OI4K, so there is no telling what mayhem this group will inflict on the CZW roster! 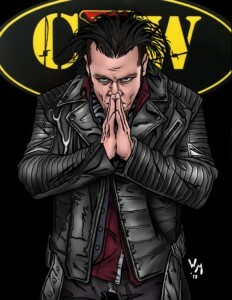 Sami Callihan joins MJF in the 5th Edition of the CZW game. Keep an eye out the rest of October for more names in the CZW 5th Edition game pack. The game will be released in early November and will be available at the November 11th show entitled Hot Buzz. 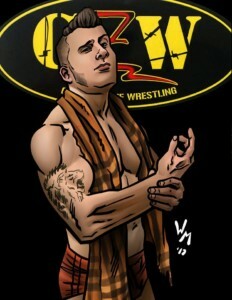 CZW’s Wired Champion MJF Joins CZW 5 Game! The first name announced for the the 5th release in our CZW game series is the hottest rising star in CZW, and the current CZW Wired Champion, Maxwell Jacob Friedman! MJF is rich, good looking and talented. As he likes to say “I’m better than you, and you know it.” He made his CZW main roster debut at Cage of Death 2016 to a shower of boos, as he represents the embodiment of everything the CZW faithful hates. 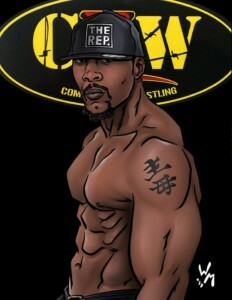 While many chalked up his conceit to over-confidence, so far he is a man of his word and remains undefeated in CZW. In May he went on to defeat Johnny Yuma to capture the CZW Wired Championship, a title he has gone on to defend multiple times. Can MJF’s talent continue to carry him further to the top and capture the ultimate prize…the CZW Heavyweight Championship? Keep an eye out the rest of October for more names in the CZW 5th Edition game pack. The game will be released in early November.